Not to be confused with Murato language. 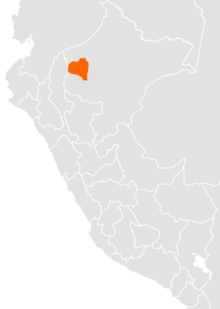 Candoshi-Shapra (also known as Candoshi, Candoxi, Kandoshi, and Murato) is an indigenous American language isolate, spoken by several thousand people in western South America along the Chapuli, Huitoyacu, Pastaza, and Morona river valleys. There are two dialects, Chapara (also spelled Shapra) and Kandoashi. It is an official language of Peru, like other native languages in the areas in which they are spoken and are the predominant language in use. Around 88.5 percent of the speakers are bilingual with Spanish. The literacy rate in Candoshi-Shapra is 10 to 30 percent and 15 to 25 percent in the second language Spanish. There is a Candoshi-Shapra dictionary, and grammar rules have been codified. Candoshi is not closely related to any living language. It may be related to the extinct and poorly attested language Chirino. Four words of Chirino are mentioned in Relación de la tierra de Jaén (1586), and they resemble words in modern Candoshi. A somewhat longer list of words is given in the same document for Rabona, across the modern border in Ecuador and include some names of plants that resemble Candoshi, but such words can easily be borrowed. Among modern languages, Loukotka (1968), followed by Tovar (1984), connected Candoshi with Taushiro (Pinche). Kaufman (1994) tentatively proposed a Kandoshi–Omurano–Taushiro language family, with Candoshi the most distant of the trio. However, Kaufman (2007) placed Omurano and Taushiro but not Candoshi in Saparo–Yawan. David Payne (1981) proposes that Candoshi is related to Jivaroan, which Payne calls Shuar. Together, Shuar and Candoshi make up a putative Shuar-Candoshi family, for which Payne (1981) provides a tentative reconstruction of Proto-Shuar-Candoshi. ^ Hammarström, Harald; Forkel, Robert; Haspelmath, Martin, eds. (2017). "Candoshi-Shapra". Glottolog 3.0. Jena, Germany: Max Planck Institute for the Science of Human History. Payne, David Lawrence. 1981. "Bosquejo fonológico del Proto-Shuar-Candoshi: evidencias para una relación genética." Revista del Museo Nacional 45. 323-377. This page was last edited on 13 June 2018, at 22:39 (UTC).